Honour roll commemorates past students from the Hutchins School, Christs College, Queens College, Kings Grammar School and Franklin House School who served in World War One. An honour board, bearing the names of 442 old boys of the Hutchins and affiliated schools who took part in the Great War, 71 of whom laid down their lives, was unveiled by General Sir John Gellibrand at the school yesterday afternoon. 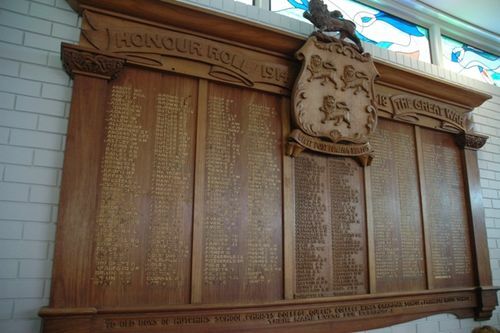 The board, beautifully carved by Mrs Payne, of Hobart, whose two sons were old boys of the school and did good war service, has been erected in the school gymnasium as a temporary expedient . It is the intention of the school authorities to add a memorial wing to the building when the time is opportune and the necessary funds are available, and this wing will contain a memorial hall in which the honour board eventually will find a permanent resting place. The Mercury (Hobart), 12th October 1922. To old boys of Hutchins School, Christs College, Queens College, Kings Grammar School, Franklin House School.